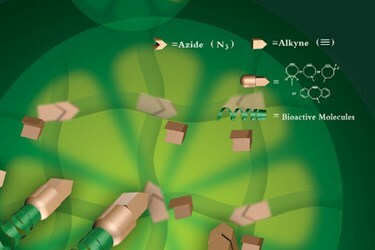 Novel polymers developed using “click chemistry” show promise in applications ranging from connective tissue replacement materials to drug releasing nanoparticles. Recent collaborations between researchers at Pennsylvania State University (PSU) and several Texas Universities are focused on using this fabrication method for polymer applications that go far beyond the technique’s roots in drug discovery. Using only readily available reagents, click chemistry synthesis is characterized by easy purification processes that avoid chromatography or other challenging analytical methods. Typically, the approach uses high-yield processes and is sometimes based on bonding smaller subunits into larger molecules. Using a citrate-based, cross-linked, biodegradable elastomer fabricated with click chemistry, PSU associate professor Jian Yang, Ph.D., has designed an anterior cruciate ligament (ACL) replacement material, as reported in a recent press release from the PSU Materials Research Institute. Historically, finding polymers with the right mechanical strength and elasticity, along with proper degradability and biocompatibility, has been challenging for this application. From a mechanical standpoint, the new polymer developed by Yang and his team was capable of withstanding up to 40 MPa of tensile stress, according to a recent article published by Yang and his team in Advanced Materials. This value is quite close to the 38 MPa that the ACL must be able to withstand and was achieved by using a copper-free click reaction that cross-linked the polymer backbones. In addition to the mechanical strength of the new polymer, bonding of bioactive molecules to its surface can be achieved with another click reaction, according to the Advanced Materials article. Adding functional molecules could enhance cell growth on the surface of the material, which in turn could facilitate growth of a natural tissue while the material degrades. As the new tissue is developed its strength eventually assumes the mechanical load. Before this occurs, however, the new tissue must be properly supported by the polymer. So an ideal degradation would be very slow at first and then accelerate once its function is accomplished. This type of degradation profile is seen in the new citrate-based polymer, according to the PSU press release. In addition to structural polymers, Yang and his team are collaborating on other projects focused drug and growth factor delivery. Leveraging his polymer expertise, he has collaborated with Kytai Truong Nguyen, a professor of bioengineering at the University of Texas (UT) at Arlington with interest in artificial platelet design. Their work has focused on designing a nanofiber/nanoparticle composite that releases vascular endothelial growth factor and platelet-derived growth factor, according to a study published by the team in Acta Biomaterialia. The new system is designed to aggregate together, like natural platelets, and cover damage to the linings of blood vessels after angioplasty procedures. The approach will protect the vessel’s delicate inner surface so a clot doesn’t form and cause the vessel to reclose. Release of growth factors is designed to instigate endothelial regrowth, an important part of the healing process. In addition to artificial platelets, Yang is collaborating with UT Southwestern Medical Center professor Jer-Tsong Hsieh to fabricate dual-function nanoparticles that contain a class of prostate cancer drugs called genotoxins. The nanoparticles’ second function will be as a fluorescent tag that will help identify cancer cells that have ingested them.